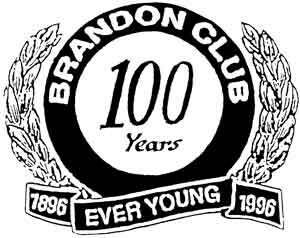 The Brandon Club was formed in 1896 as a gentleman’s retreat patterned after the great Clubs of jolly old England. 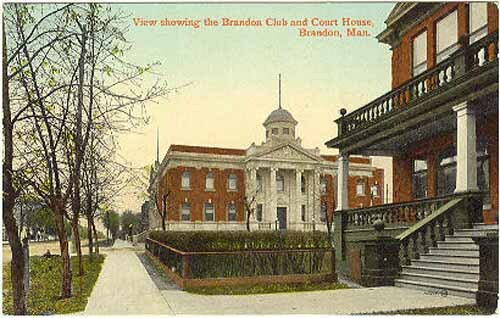 Its clubhouse at the corner of Eleventh Street and Princess Avenue in Brandon, opposite the old Provincial Courthouse, was designed by local architect W. R. Marshall and built in 1904. It featured oak and mahogany woodwork throughout, a fireplace in almost every room, and a second-floor balcony from which its gentlemen members could sit and enjoy an expansive view of the surrounding fields and forests, and the stable of horses from which members could go riding in the countryside. Rescued during the Great Depression by Brandon Sun proprietors Ernest Whitehead and Ted Woodley, the Club gradually changed with the times. In the 1940s, women were permitted to attend special functions and, by the 1960s, to become members. Today, the Brandon Club is a social center for men and women from all walks of life, and its members contribute to a range of local charities. Plans exist for restoring the clubhouse to its former glory, reopening windows covered over long ago in the name of energy conservation, and exposing a grand mural hiding behind wall paneling. The Manitoba Historical Society hopes, in some small way, that recognition of the Brandon Club with a Centennial Organization award will help with this transformation and renewal. An MHS Centennial Organization Award was presented to members of the Brandon Club by Lieutenant-Governor John Harvard, Jacqueline Friesen, and Gordon Goldsborough on 3 April 2005. In early June 2005, the Brandon Club closed and its assets were sold at auction on 18 June 2005. The historic clubhouse was purchased by a Brandon lawyer, who planned to convert it into residence and office space (Brandon Sun, 19 June 2005, page 3).